The ODROID-C0 is a computer for those who wish to make a more flexible and portable applications. It is a minimized hardware version of the ODROID-C1+. Battery power circuit is fully integrated. Just attach a 3.7V Li+ battery and make it mobile. It is highly suitable for IoT projects, wearables, and other applications that require a lightweight device. All the ODROID-C1/C1+ OS images are fully compatible with the ODROID-C0. Some of the modern operating systems that run on the ODROID-C0 are Ubuntu, Android, Arch Linux, Debian, and OpenELEC, with thousands of free open-source software packages available. There are also plenty of custom OS available for using the ODROID-C0 as a multimedia center, Kodi, gaming station, headless server and much more at our ODROID community. * Battery voltage level is accessible via ADC in the SoC. Best low-cost environmental sensing solution with BME280 and Si1132 on one board.The combination of .. 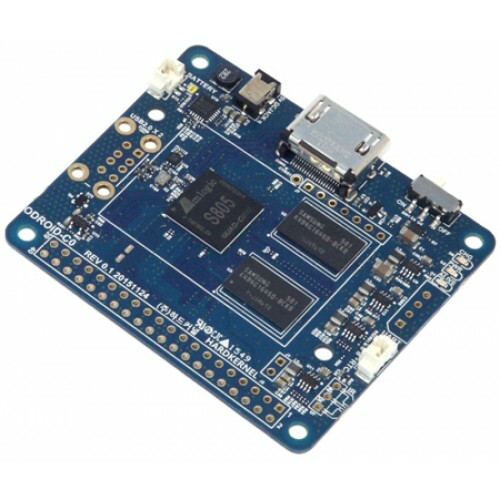 The Odroid Wifi Module 3 is a highly integrated single-chip Wireless LAN (WLAN) USB2.0 network ..
Now In StockIEEE 802.11a/b/g/n WLAN module with on-board 2.4Ghz and 5Ghz Dual band antenna.Works wit.. The ODROID-SHOW is the Arduino compatible that lets you see what your ODROID or PC is thinking using.. The mini USB Bluetooth dongle.CSR8510 A10 Chipset insideSupportsClassic Bluetooth v2.0Bluetooth High.. Please note picture is for iinformation only - board not included with display.Fully assembled 3.2in..
for ODROID-C1/C1+/C2You're probably itching to make some fun embedded computer projects with ODROID-..
Works with the ODROID-C1/C1+ on-board IR receiverInfrared remote controller12 Keys function37.9Khz C.. The myAHRS+ is a high performance AHRS(Attitude Heading Reference System). Its attitude output ..
RTC backup battery Lithium primary battery to back up the RTC on XU4/C1+ board. This battery can kee..
Uninterrupted Power Supply is an electrical apparatus that provides emergency power to a load when t..
Works with ODROID-C1 / ODROID-U3 PCB Rev 0.5 or higher.You will have another USB host port if you pl..
USB Audio Adapter works with ODROID-C1+/C2/XU4.The USB Audio Adapter is a highly integrate..
* Real 720P HD resolution, 16:9 wide screen output* USB2.0 High-speed and plug-n-play interface (UVC.. Compatible for ODROID-X2 / U3 / U2 / XU / XU3 / C1USB to IO expansion board for GPIO/PWM/SPI/UART/I2..
For ODROID-C1+/C2DC Plug specification : Inner diameter 0.8mm and outer diameter 2.5mmCable Length :.. Compatible with ODROID-C1+/C2/XU4System console interface board for platform development and debuggi..
for ODROID-C1/C1+ (includes microSD adapter)Pre-installed Android 4.x or latest version fo..
for ODROID-C1/C1+ (inc microSD Adapter). Click here to viewPre-installed Xubuntu 14.04 or latest ver..
for ODROID-C1/C1+ (inc microSD Adapter)Pre-installed Android 4.x or latest version for OD..
for ODROID-C1+ (inc microSD Adapter)Pre-installed Xubuntu 14.04 or latest version for ODROID-C1/C1+..
for ODROID-C1+ (inc microSD Adapter)Pre-installed Android 4.x or latest version for ODROI..
for ODROID-C1Pre-installed Xubuntu 14.04 or latest version for ODROID-C1/C1+. Ready to run out ..
for ODROID-C1/C1+Pre-installed Android 4.x or latest version for ODROID-C1/C1+. Ready..
** [EXPECTED LATE OCTOBER] **ODROID-C1/C1+Pre-installed Android 4.x or latest version for ..
** [EXPECTED LATE OCTOBER] **for ODROID-C1/C1+Pre-installed Xubuntu 14.04 or latest version for ODRO..
** NOT IN STOCK ** for ODROID-C1+ (inc microSD Adapter)Pre-installed Android 4.x or..
** NOT IN STOCK ** for ODROID-C1+ (inc microSD Adapter)Pre-installed Xubuntu 14.04 or latest .. Compatible with ODROID-W / ODROID-SHOW2Lithium Polymer rechargeable cell with a protection circuit.C..
*** Stock expected late March ***SmartPower2 is a power-supply which has WiFi connectivity to contro..
Ublox 6010 chipset with a patch antenna 50-channel u-blox 6 engineGPS L1 C/A codeSBAS: WA..
for ODROID-C1+/C2This ODROID-C1 Shield makes it easy to use - Blue and white 16x2 Character LCD..
7-inch multi-touch screen for ODROIDs gives users the ability to create all-in-one, integrated proje.. The oCam supports plug-and-play by UVC compliant adapting the standard M12 lens with focal length of..
Are you ready to drive a race car? The Universal Motion Joypad is a new game controller that is s..
VuShell is a laser cut acrylic enclosure for the ODROID-VU7 (not included). You can make your o.. Compatible with ODROID-C0Lithium Polymer rechargeable cell with a protection circuit.Capacity : 3000..
Mediatek Ralink RT5370N is a cost-effective, highly integrated USB Wi-Fi single chip containin.. This is a perfect connector pack for various DIY projects with the ODROID-C0.You need a soldering sk..
NOW IN STOCK7-inch multi-touch screen for ODROIDs gives users the ability to create all-in-one, inte..
Xprotolab Plain is an Oscilloscope, Logic Analyzer, Waveform & Clock generator all in one tiny, ..
Works with ODROID-C1 / C1+ / XU4(combination with XU4 Shifter Shield)What's better than a.. This heatsink might be useful for who needs a low noise solution with ODROID-XU4. The stock active c..
** STOCK EXPECTED LATE MARCH **Now with Audio capabilty.5-inch multi-touch screen for ODROIDs gives .. The Biscuit™ is an integrated module consisting of 3 dimensional motion sensor and Wi-Fi communicati.. Compatible with ODROID XU4/MC1AC 100~240 Volt inputDC 5 Volt / 4A outputSwitching mode Adaptor.. Compatible with ODROID XU4/HC1/MC1AC 100~240 Volt inputDC 5 Volt / 2A outputSwitching mode Adaptor..
CH340G breakout board, designed to allow the addition of a USB connection to your project.This modul..
**[NOW IN STOCK ]** Compatible with ODROID - C1+/C2AC 100~240 Volt inputDC 5 Volt / 2A o..
**[NOW INSTOCK ]** Compatible with ODROID - C1AC 100~240 Volt inputDC 5 Volt / 2A outputSwitch..